With contemporary design and technology flowing through the luxurious accommodation in harmony with beautiful natural surroundings, you will find everything that you require for a great holiday in the Algarve. You will find spacious guestrooms and a variety of leisure activities for yourself and your family to enjoy: be rejuvenated in Health Club & Spa, relax in the outdoor swimming pools, while your children enjoy their very own kid’s club. Each of the 154 guestrooms at Conrad Algarve hotel offer the same combination of space, modern design, comfort and technology. The hotel’s standard rooms set a very high standard, indeed. All feature bright and airy balconies, a separate bath and rain shower, and seductive views of the destination and the natural beauty of the surrounding area. The hotel’s collection of suites are a destination unto themselves, the pinnacle being the Roof Garden Suite. The Roof Garden Suite features, amongst many other luxurious features, a plunge pool in the lounge, as well as direct private access to the spa and your own private host. 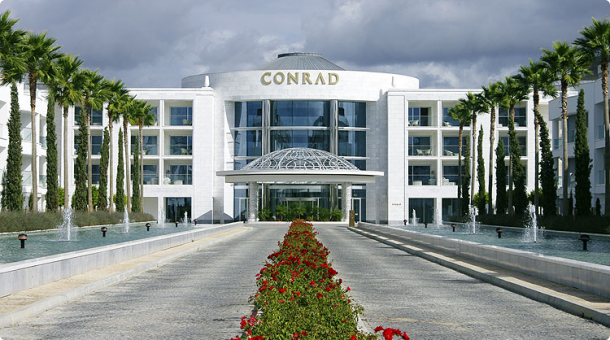 Conrad Algarve hotel offers a variety of leisure activities for you and your family to enjoy. Swim lengths in one of the pools, or lounge with an ice cream beside our outdoor swimming pools. Work on your backhand or practice your serve at this Conrad Hotel’s floodlit tennis court. Open daily, the tennis court is perfect for players of all ages and abilities to enjoy a quick, casual game with friends, or a heated doubles match. You can explore the sorrounding golden sandy beaches and golf courses,or visit the shopping arcades, where you will find a variety of designer shops and local artisan shops selling Portuguese arts and crafts. Shop for hand-crafted souvenirs, charter a boat for big-game fishing or scuba diving, or simply sit back and enjoy a glass of wine in your own room terrace. You can do all this while the kids enjoy their very own Kids Club. A world of adventure awaits. Children aged between four and twelve are welcome to stay and enjoy themselves with range of games and activities from treasure hunts to video games, There is a schedule of various daily activities which can be tailored to fit your child’s needs. Special children’s menus are available in all Conrad Algarve restaurants.